Recombinant canine N-terminal pro-B-type natriuretic peptide (NT-proBNP) and monoclonal antibodies for the detection of canine cardiomyopathy. - Advanced ImmunoChemical Inc.Advanced ImmunoChemical Inc.
Home » Assay Notes » Recombinant canine N-terminal pro-B-type natriuretic peptide (NT-proBNP) and monoclonal antibodies for the detection of canine cardiomyopathy. 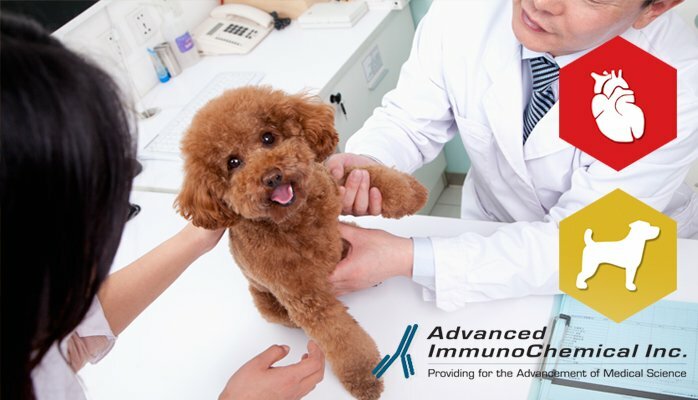 Advanced ImmunoChemical offers 11 monoclonal antibodies and the recombinant antigen for the detection of N-terminal pro-B-type natriuretic peptide (NT-proBNP) in canines. These products are sufficient for immunoassay development for the determination of NT-proBNP levels in canine blood. All antibodies offered have shown to identify both the recombinant and native NT-proBNP in canine blood. The N-terminal pro B-type natriuretic peptide is a hormone whose detection is used as a biomarker for the presence cardiac disease in dogs. Canine NT-proBNP is significant to the clinical veterinary setting, as increased levels in the blood are closely linked to canine heart failure and cardiomyopathy (1). Recent studies show that the close tracking of the concentration of NT-proBNP in the blood of canines can be used to help determine and diagnose right-sided congestive heart failure (2). NT-proBNP measurement quantification facilitates the diagnostic process as its presence indicates a cardiac abnormality specifically. For example, research shows that NT-proBNP concentration in blood helps to determine whether primary respiratory tract disease or congestive heart failure is causing respiratory illnesses in canines (3). The measurement of NT-proBNP in canine plasma, when paired with additional factors such as a pressure gradient, can also be used to assess the intensity of pulmonic stenosis, as symptomatic dogs exhibit elevated levels of NT pro-BNP (4). (1) Boswood, A. et al. (2008). The diagnostic accuracy of different natriuretic peptides in the investigation of canine cardiac disease. J Small Anim Pract 49(1): 26-32. (2) Kanno, N. et al. (2016). Plasma atrial natriuretic peptid and N-terminal pro B-type natriuretic peptide concentrations in dogs with right-sided congestive heart failure. J Vet Med Sci 78(4): 535-42. (3) Oyama, M.A. et al. (2009). Assessment of serum N-terminal pro-B-type natriuretic peptide concentration for differentiation of congestive heart failure from primary respiratory tract disease as the cause of respiratory signs in dogs. J Am Vet Med Assoc 235(11): 1319-25. (4) Kobayashi, L. et al. (2014). Plasma N-terminal pro B-type natriuretic peptide concentrations in dogs with pulmonic stenosis. J Vet Med Sci 76(6): 827-31.